At the invitation of the Russian government, Vice Chairman of the Standing Committee of the National People's Congress (NPC) Arken Imirbaki will attend the fifth International Arctic Forum in Russia from April 8 to 12. Q: First question, on Monday, US federal prosecutors filed a lawsuit against Zhang Yujing, a Chinese woman whom they allege attempted to enter Mar-a-Lago last Saturday. Can you give us more details? Has she requested consular assistance from the Chinese Consulate General? And second question, it is said that there are Chinese PLA military advisers assisting the Maduro administration in Venezuela. Do you have any comment? A: Regarding your first question, I'm not aware of that. As for the second question, I don't know where you got this information or for what purpose was it produced, but I can tell you this: what you said is simply not true. The Chinese government's position on the Venezuela issue is consistent and clear-cut. We firmly uphold international law and the basic norms governing international relations, object external interference in Venezuela's internal affairs, and believe the country's government and opposition need to seek a political solution through peaceful dialogue. Following the principle of equality, win-win cooperation and common development, we will continue to advance China-Venezuela relations and cooperation in various fields. Q: According to Japanese media, the Chinese Ambassador to Japan Cheng Yonghua will leave office next month, and he is said to be succeeded by China's Vice Foreign Minister Kong Xuanyou. Can you confirm that? A: I have nothing specific to tell you at the moment. The appointment and assumption of office of Chinese ambassadors need to go through due procedures. Q: The US said it will not send a high-level delegation to China to attend the second Belt and Road Forum for International Cooperation (BRF) this month. What's your comment on that and do you have any understanding as to why? A: I have noted relevant reports from the media. If this is the decision of the US, they are better suited to answering your question. The Belt and Road Initiative is an open, inclusive and transparent initiative for economic cooperation. Following the principle of consultation and contribution for shared benefits, we welcome like-minded countries to participate in the BRI for win-win outcomes. Preparations for the second BRF are well underway. So far, representatives from over 100 countries including nearly 40 foreign leaders have confirmed their attendance. As the host, China has every confidence of the success of this event. We will work with all parties for more concrete outcomes of the BRI cooperation that benefit people of all countries. Q: The Russian Foreign Ministry said in a statement yesterday that the Group of Governmental Experts (GGE) established pursuant to the UNGA resolution 72/250 held discussions on the substantial elements of an international legally binding instrument on the prevention of an arms race in outer space in Geneva in mid-to-late March, during which experts from 25 countries including Russia, China and Brazil tried to work out a consensus-based report. But the US blocked the adoption of the GGE's final report and gave no explicit explanation. I wonder what's your comment on that? A: Prevention of an arms race in outer space is a shared aspiration that has long been pursued by the international community. 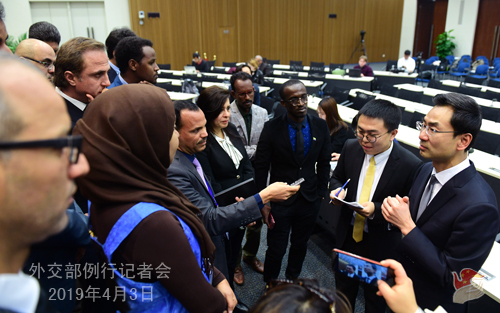 Considering the importance and urgency of this issue and following the advice of China, Russia and other countries, the UN established the Group of Governmental Experts with members from 25 countries, aiming to consider and make recommendations on the substantial elements of the relevant international legal instrument. Thanks to the GGE's hard work during the two meeting sessions, a consensus was almost reached for the adoption of a final report that would hopefully make important contributions to outer space security. However, blocked by a certain country, the GGE failed to adopt such a report. China deeply regrets that. China stands for the peaceful use of outer space and opposes an arms race in and the weaponization of outer space. We hope relevant parties will look at this issue objectively for the common security of all countries, actively participate in the international outer space arms control process, and earnestly safeguard the lasting peace and security in outer space. Q: On April 2, the Supreme Court in Comoros officially released the country's presidential election result and confirmed incumbent President Azali Assoumani's winning with 59.05 percent of the vote. I wonder if you have any comment on it? A: We have noted the election result announced by the Supreme Court of Comoros and would like to congratulate Mr. Azali Assoumani on his reelection as the President of Comoros. China and Comoros enjoy traditional friendship. As China attaches high importance to the bilateral ties, we stand ready to work with the Comoran government led by President Azali Assoumani in his new term to strengthen friendly cooperation through the Forum on China-Africa Cooperation and the China-Arab States Cooperation Forum and elevate China-Comoros friendly and cooperative ties to a higher level. Q: Yesterday President Abdelaziz Bouteflika of Algeria declared his resignation after months of demonstrations. Do you have any comment? A: We have noted relevant reports. President Abdelaziz Bouteflika is a veteran leader of Algeria who has made significant contributions to China-Algeria relations. We believe the Algerian people have the capability to ensure a smooth process of political transition and maintain national security and stability. Q: According to Hindustan Times, the US State Department said "while we strongly prefer the UN Security Council designation take place through the committee process, the US and its allies and partners will utilize all available resources to ensure Masood, leader of Jaish-e-Mohammed, is held accountable." 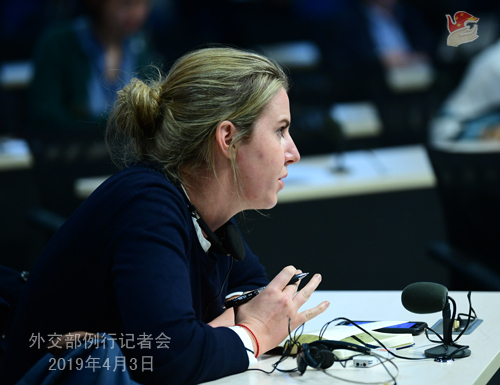 It also confirmed that the draft resolution moved by the US last week is supported by France and Britain. I wonder what is your comment on that? A: Last Friday, members of the UN Security Council exchanged views on the draft resolution circulated by the US. The majority of them agreed that the listing issue should be resolved through dialogue and consultation under the 1267 Committee instead of by pushing for a vote on the draft resolution. Recently China has been working on all parties and achieved positive results. The US is aware of that. However, it still prompted the draft resolution to be adopted at the Security Council, which makes no sense at all. What the US did has set a bad precedent as it is not in line with the Security Council rules and customary practices. It will only complicate matters and will do no good to peace and stability in South Asia. 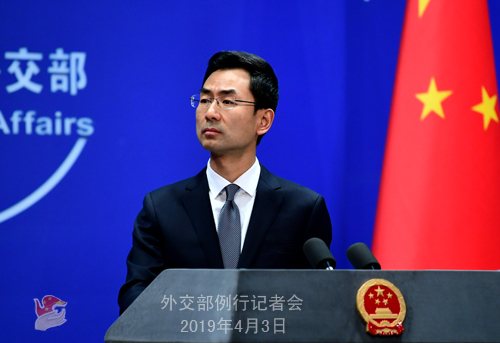 China will continue to engage in the discussion and review of the relevant listing issue in a responsible and constructive manner. We hope it will be properly resolved in the end. Q: So far no solid proof has come out about the involvement of Jaish-e-Mohammed in the Pulwama attack. But on the other hand, a retired Indian general, who served as corps commander in Indian-held Kashmir, speaking at a seminar in London, said that the Pulwama incident was inevitable because of the Indian government's policies in the region. What is your comment? A: China has already made clear its attitude on the attack that recently took place in Indian-controlled Kashmir. We hope to see peace and stability in South Asia and that India and Pakistan will resolve the relevant issue through dialogue and consultation. 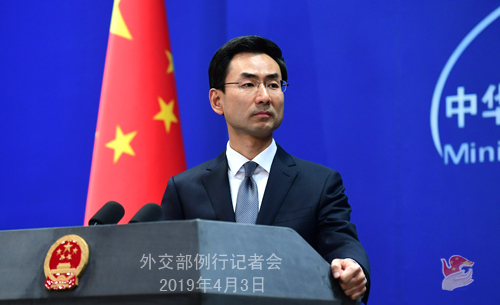 Regarding the listing issue, as I said earlier, China will continue to engage in the discussion and review of the relevant issue in a responsible and constructive manner. We hope and believe it will be properly resolved in the end.